The green bell pepper plant is one of my favorites in the garden. I have never experienced a disease or pest problem with these perfect little plants. Not to say that problems don’t exist. Peppers are prone to accumulations of aphids on the underside of the leaves, especially near growing branch tips. If you use tobacco products, be sure to wash your hands before handling because of possible spread of tobacco mosaic disease. The scientific name for bell peppers is Capsicum annuum. Bell peppers are actually considered fruits. According to wikipedia, Any vegetable with seeds is considered a fruit. Examples include tomatoes, cucumbers, squash, pumpkins, hot peppers, and eggplant. Peppers have a broad range of antioxidants, especially carotenoids. Other antioxidants include vitamin C (twice as much as an orange), and vitamin E. In addition to these vitamins, bell pepper is also a good source of the mineral manganese. The list of bell pepper phytonutrients is also quite amazing. Paprika is a spice made from ground, dried fruits of capsicum annuum. Paprika varies in spiciness depending on the peppers used, but will always turn out the same general color. Bell peppers belong to the nightshade (Solanaceae) family of plants, along with eggplant, tomatoes and potatoes. Many nightshade plants contain ingredients that are used within modern and herbal medicines. We usually start our peppers indoors under grow lights. When soil is warm enough and danger of frost is long gone, we will transplant them in the garden or in buckets. 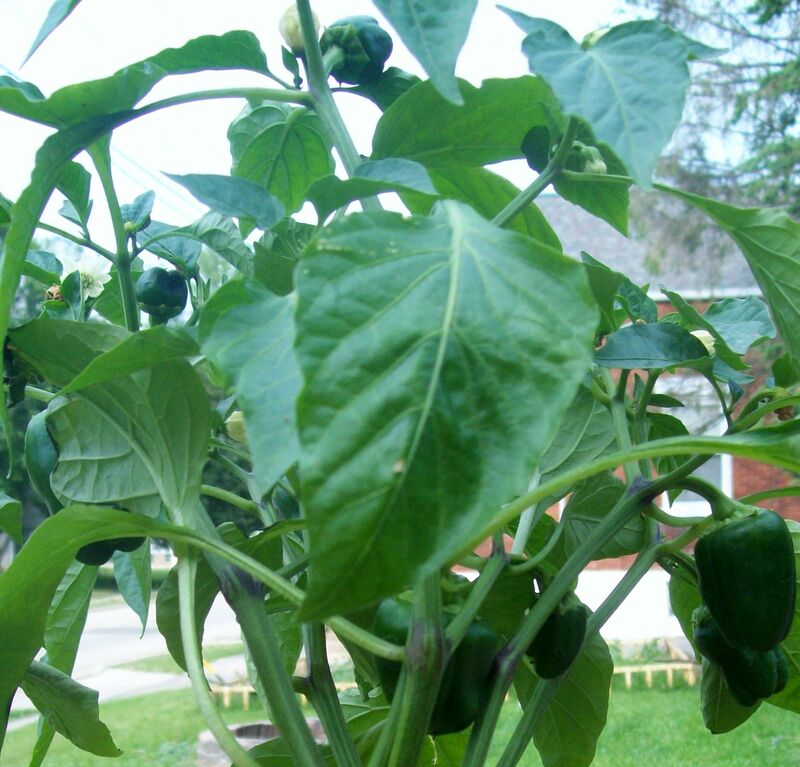 The pepper plant shown in the picture above is from an organic grocery store green bell pepper. We dried the seeds for about two weeks before planting. Peppers thrive in a well-drained, fertile soil. You can harvest the peppers at any size, but I leave them on the plant as long as possible to grow bigger and develop even more vitamin C.
There are so many wonderful recipes for bell peppers that it’s hard to pick just one to add to this post! I eat them in omelets, pizza, stuffed, in salsa, or on salads. You name it, if I’ve got them I will add them! Brown beef and drain fat. Then add onion, sauce, rice, torn up basil, and a generous sprinkle of the parmesan cheese. Mix together very well. (I like to add fresh chopped garlic also). Wash and dry peppers and then cut the caps or stems off of the top. Many people boil the peppers before stuffing, but then you lose all of that delicious pepper flavored juice as it is cooking! Scrape out the guts of the peppers and fill with rice mixture. Place on a sheet pan and add a 1/2 cup of water to the pan to keep the peppers moist during cooking. Cover with foil and cook for 1 hour at 375 degrees. During the last 10 minutes of cooking, remove foil and top with mozzarella cheese. Posted by Createityourself on May 25, 2012 in Cooking and Baking, Natural Medicine, Plants and Gardening and tagged bell peppers, gardening, green peppers, recipes, seed saving, stuffed peppers. Yes, I believe they do turn red. I should have mentioned that in the post, but I was never able to get them to turn red for some reason…probably impatience! Making them in the slow cooker sounds like a great idea and less pans to wash! Thanks for commenting! I asked if the peppers turned red because my chillies sometimes turn from green to red. However, I have no explanation for why only some do – it can’t be purely down to how long they are on the plant. If I stuff the peppers with rice, then I cook that first so it is still more than one pan, but overall I do find slow cookers such an asset in the kitchen. love my peppers. they are great fresh off the plant also. that recipe made me hungry but my organic person is not in town! he was kind enough to give me a persons number though. your recipe sounds like my own and it is delicious! I just planted a purple bell pepper plant, so it’s great to read this post!